There is a real lack of amusing church marketing mainly because churches shouldn’t be invested in marketing. An Ohio church’s attempt did fill the void. There is a real lack of amusing church marketing. This is because churches shouldn’t market – they should tell the Truth, love their neighbors, and take care of practical needs. That’s church marketing enough. But once in a while you see a church or a pastor doing something truly unique and downright fascinating. I just saw such a thing over at The Daily. Salvation isn’t automatic — but it might be semiautomatic. Hilarious. 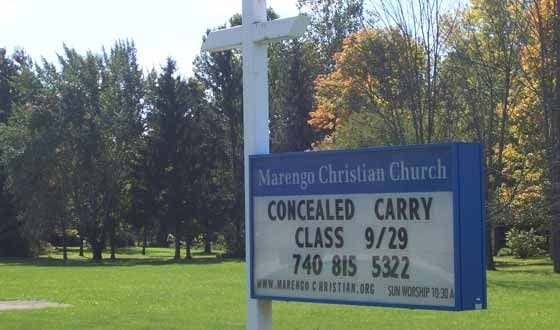 Concealed weapons training at church to attract local men. We’ve seen it all. And I’m very amused. I can see doing men-friendly events and I wouldn’t necessarily call that marketing, but offering concealed carry classes seems to be a stretch. I can see having an outside group conducting them in your building. If you have a church building it’s a waste if you don’t allow it to be a community resource. To conduct the classes themselves in order to reach men though… reach men with what exactly? Why would any Christian man need carry a concealed weapon or a weapon at all for that matter. A weapon is used for one purpose and one purpose only thus being to defend oneself which has absolutely nothing to do with being a Christian knowing our battle is not against flesh and blood rather principality’s and things of the air. A firearm is for the sake of hunting not men rather food. A weapon has an entirely different meaning and therefore purpose. Did Jesus Preach Paul’s Gospel?